Here’s what’s up in the world of TV for Wednesday, March 8. All times are Eastern. 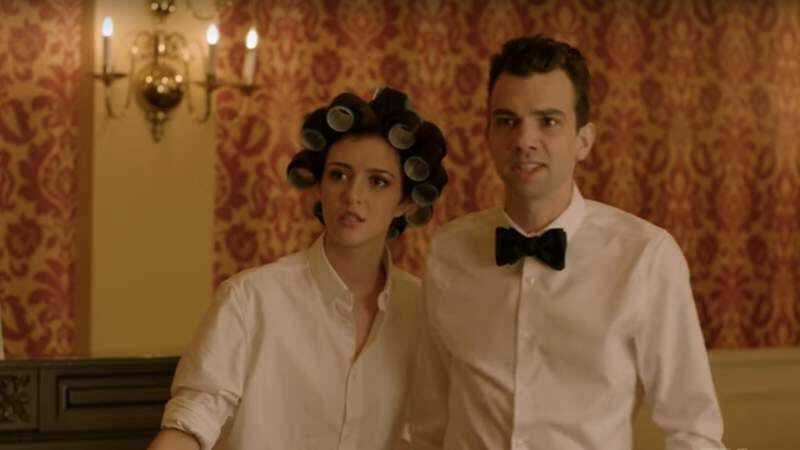 Man Seeking Woman (FXX, 10:30 p.m.): The third season of FXX’s relationship comedy comes to a close as Josh and Lucy prepare to tie the knot. Danette Chavez has been touting the quality of this show all season, so what better time to tune in than for the episode she suspects might turn out to be not just the season finale, but series finale? That way, years from now, when your children ask what you were doing that fateful night of March 8, 2017, rather than bore them with the tale of how you saw the alien ships arrive and unite the world in brotherhood forevermore, you can let them know you saw Lucy’s mom and Josh’s stepdad try to meddle in the wedding plans. The Magicians (Syfy, 8 p.m.): Who doesn’t love a good bank heist? Other than Andy Garcia, Catherine Zeta-Jones, and Al Pacino in Ocean’s 11, 12, and 13 respectively, of course. The gang goes after some gold in this episode, though sadly, not of the Emmy variety quite yet. Modern Family (ABC, 8 p.m.): Phil is playing in a charity basketball game, which seems like the kind of thing that will definitely go well, and for sure lack any embarrassing moments of the sitcom-esque variety. Especially since guest stars Charles Barkley and DeAndre Jordan will be there. Black-ish (ABC, 8:30 p.m.): Anthony Anderson and company return after a week off. What has changed in the meantime? Apparently not America’s toys, as ”ToysRn’tUs” sees a trip to the store result in a pissed-off Bow bemoaning the lack of black dolls for sale. It’s Always Sunny In Philadelphia (FXX, 9 p.m.): “Dennis reveals that he has a baby from his layover time in North Dakota and everyone offers solutions to the problem, but in the end, Dennis must decide which life to continue to lead.” Surely, he’s going to do the right thing and move to North Dakota to raise his child, right? You’re making this too easy, It’s Always Sunny promo description. Legion (FX, 9 p.m.): This is an amazing show. You’re already watching it, right? Or is this the same thing we had to do with Noah Hawley’s Fargo, where you waited until the first season was almost over and everyone had to yell at you before you finally tuned in? Don’t be that person this time. Underground (WGN, 9 p.m.): For those of you who watched season one of WGN’s excellent series set in the antebellum South, but thought to yourselves, “Hmmm, needs more Harriet Tubman,” have we got a treat for you. Danette Chavez will be bringing you weekly reviews starting tonight with the second-season premiere. Dog Soldiers (Chiller, 6 p.m.): Before he became Game Of Thrones’ go-to director for its spectacular installments of battle-centric chaos, Neil Marshall launched his career in helming bloody mayhem with this tale of British soldiers who encounter bloodthirsty werewolves in a remote countryside. It’s a smart and thrilling low-budget horror flick that showcases his flair for the gruesome.